The Fat Flush Diet is broken down into three phases, you can think of them as Prepare, Lose, and Maintain. While you are following the diet, you are also expended to exercise about a half hour a day. This doesn't have to be a brutal HIIT program; walking or casual weight lifting is fine. Phase one lasts for a week or two. This is the most challenging phase, because your diet is limited to 1,100 to 1,200 calories. This is right on the edge of the FDA’s recommended minimum caloric intake for a healthy diet. You also give up a lot of foods, like sugar, fats and oils, grains, cereals, dairy, starchy vegetables, even margarine. Your goal during this phase is to lose bloat, so expect to see some water weight drop off. That happens while you drink a lot of cranberry juice mixed with water and lemon juice in water. A pretty typical cleanse routine. Phase two, the “lose weight” phase, boosts your daily caloric intake to 1,200 to 1,500 calories. You add back in some foods, too, like brown rice, carrots, squash, peas and sweet potatoes. You stay in phase two until you reach your goal weight, no matter how long that takes. Your exercise regimen continues. Phase three is your “diet for life” or maintenance phase. This defines your future eating plan. You are allowed 1,500 calories a day (the FDA would be proud) that comes from 40% carbs, 30% proteins and 30% fats. Gittleman warns against eating gluten, so your pastas and breads will be gluten-free hereafter. Your exercise program should gradually increase as your body becomes stronger. Is the Fat Flush Diet right for you? Most doctors question the validity of “flushing toxins” associated with any diet. The balance of the diet, though, is sensible and not too restrictive. There’s a nice balance between eating sensibly and exercising moderately. This could be something that you stick with. 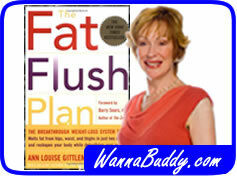 Have your tried the Fat Flush Diet? Let us know your experiences!